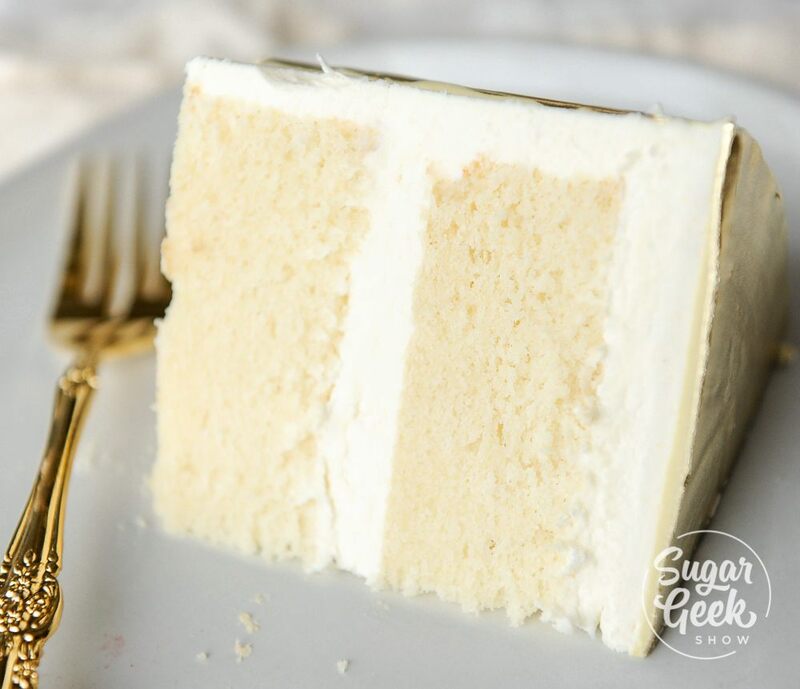 This white cake recipe is the perfect classic white cake. Light and fluffy, moist and full of flavor. There is a joke in the cake world that white is not a flavor, it’s actually a vanilla cake. But a white cake is not just white. 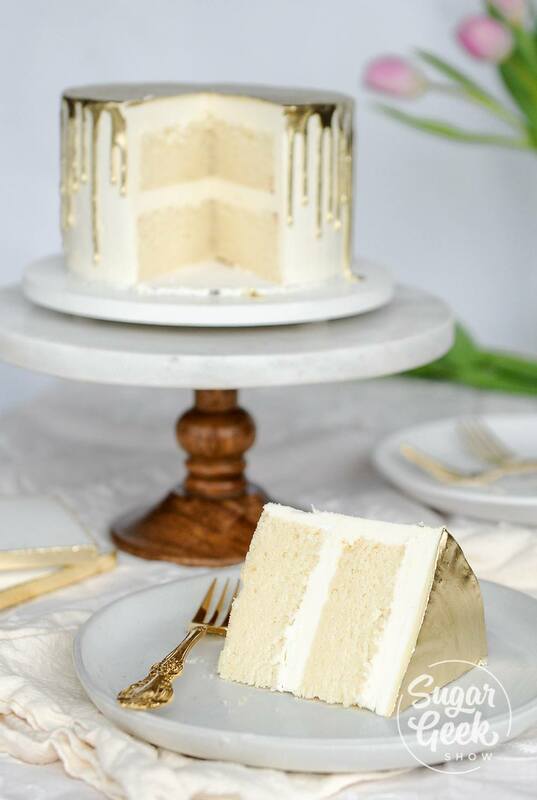 Let’s dive into what makes the perfect, best white cake recipe. What Is The Difference Between White Cake Recipe And Yellow Cake Recipe? Many people confuse white cake recipes with yellow cake or even vanilla cake. Although similar, these actually are totally different types of cakes. Mostly to do with how the eggs are incorporated. A white cake recipe only uses the whites of the egg, sometimes whipped and then folded into the batter, sometimes added directly to the butter/sugar mixture. 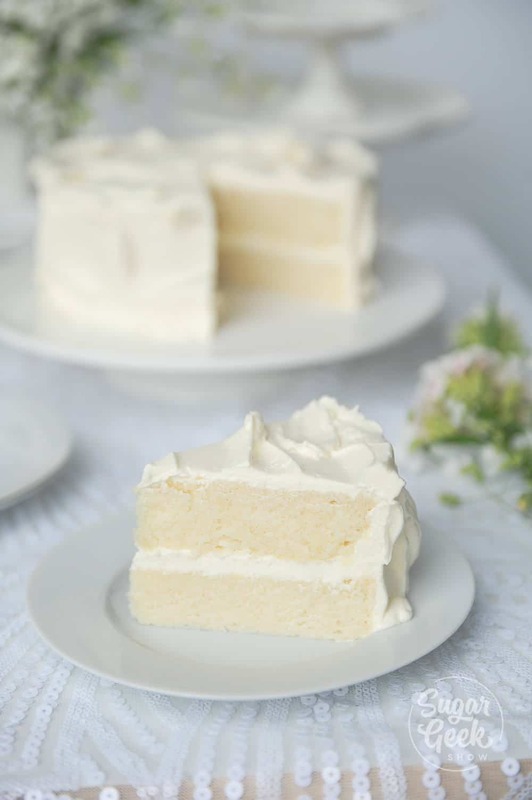 Vanilla cake uses both the egg whites and the egg yolks (usually) and results in a slightly off-white colored cake but in my opinion has the most flavor. A yellow cake is made with the egg yolks only so the batter has a very rich and golden color with lots of flavor and is a very moist cake. 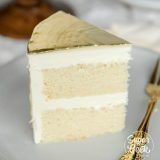 Vanilla and white cake recipes are both used in many different recipes as a base by substituting out spices or extracts. Yellow cake is traditionally paired with rich chocolate buttercream or ganache and is not often used as a base recipe for other flavors although it certainly could be. Again, people laugh and say that “white” and “yellow” is not a flavor but making an order for “all egg yolk cake” just does not have the same ring to it. It’s just a way of describing the cake so we all are on the same page. How Do You Make White Cake? To make the best white cake recipe ever, you need to make sure you’re using the right ingredients. For this recipe we are using AP flour because it is the most versatile. We are also using a high-quality butter that does not have any artificial dyes in it (did you know some companies dye their butter to be more yellow?) The whiter the butter, the whiter the cake. Traditional white cake uses almond extract which happens to also be clear. Now, I myself do not love the taste of almond extract so I prefer to use vanilla bean paste and vanilla extract. BUT WAIT! You said that the ingredients had to be clear! True, I did say that but here we come to one of those “taste over color” rules in my book. There are not a lot of ingredients in this recipe that bring flavor to the table but the quality of the extract is #1. The vanilla bean paste and the extract WILL slightly tinge the batter to not a PURE white but for me, I’d rather have that than no flavor at all. If you absolutely must have a white color then feel free to halve the vanilla in this recipe and add 1/2 tsp of almond extract. Another reason you might want to use almond extract or you can even use clear vanilla (imitation) extract is if you’re using this white cake recipe as a base for another cake recipe like my strawberry cake where color is really important. The whiter the cake batter, the truer the color will be after adding colors. Why Is There Oil In This White Cake Recipe? Funny thing, when we bite into a cake, certain things make us think “YUM!” Texture, flavor and moisture. Texture is achieved by proper mixing methods, flavor is achieved with high quality extracts but moisture is a tricky thing. You can’t just dump more moisture into your cake batter or you’ll end up with a gummy mess. One thing that makes your brain think “moist” is the addition of a little oil. I don’t like to add too much, about an ounce will do. I prefer to use vegetable oil because it doesn’t have a flavor and is colorless. If you don’t want to use vegetable oil you can use any other mild flavored oil. Should You Put Sour Cream In White Cake? A long long time ago (we’re not going to talk about how long) I remember reading in the cake forums about this magical white cake recipe called WASC cake that all the cake decorators used. I had no idea what it was but desperately wanted to know! Soon, I learned that WASC stood for White Almond Sour Cream cake and the first ingredient is a white box cake mix. Now, I don’t actually have anything against anyone who uses boxed mixes or doctors boxed mixes. For my personal journey as a cake decorator, I was looking to make my own recipes that would make me stand out. Anyone can whip up a box mix but then it just tastes like everyone else’s cake. You see what I’m saying? So why would you use this type of white cake recipe? Well not everyone is a scratch baker or wants to be. Or maybe they just want a quick and easy cake recipe that will for sure turn out. This recipe is definitely a no-fail and is what you might call a “doctored box mix”. The addition of the sour cream and eggs makes it more flavorful and moist. It also detracts from that “chemical” taste that most box mixes have. Would I suggest you make this instead of scratch mix? Well really that’s up to you. I promise I won’t hold it against you one way or the other. Just always be up-front with your customers (if you have them). If you say you bake from scratch then bake from scratch. If you use a box, it’s perfectly ok to say you use “freshly baked cakes”. So here’s the deal with white cake recipes. Just like with most things, there more than one way to skin a cat… er… bake a cake. Who even came up with that saying? So bizaar. So anyway, as I was saying. There are multiple ways to make a white cake recipe but I’m going to make it REALLY easy for you. Option one is the traditional mixing style of creaming your butter and sugar together until light and fluffy. Then add in your egg whites until combined. Then add in dry ingredients and liquids. This is the route I go. The other option is you whip up your egg whites to a soft but firm peak. Then you cream butter and sugar as usual and alternate your dry and liquid ingredients until combined. You then fold in your egg whites into the batter. This technique results in a lighter, more delicate cake but CAN potentially cause over-mixing. You can try both ways and see what you like best. One more tip, I always wrap my cakes while they are still warm. Wrap in plastic wrap and then place into the freezer. This locks in the moisture of the cake. Once cooled but not frozen, you can trim the brown edges off your cake (optional but results in a whiter slice) and frost with a nice white buttercream or any frosting you desire. Want to learn more about how to decorate a cake like a pro? 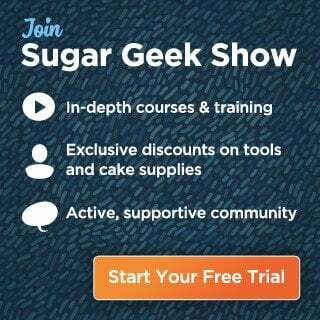 Check out my FREE training on how to make your first cake ever! 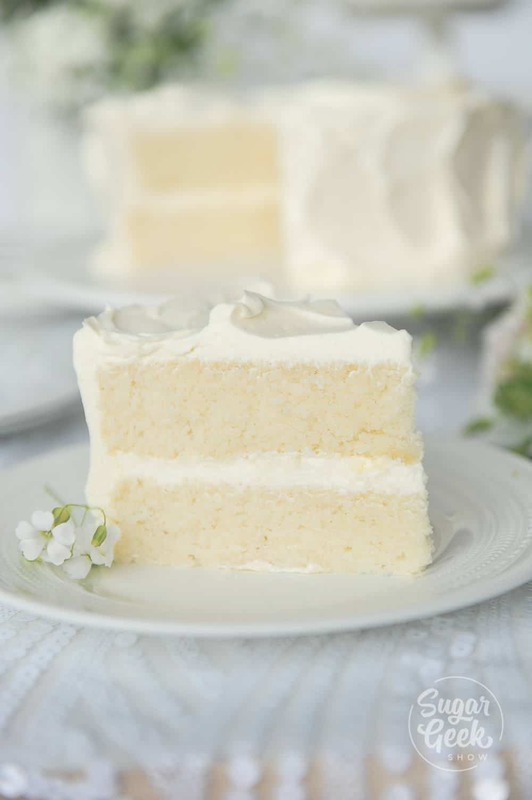 A white cake recipe that is light, fluffy, full of flavor and easy to make! A great base recipe for any baker that can be adapted to other recipes. Add in egg whites one at a time (roughly) and let fully combine after each addition before adding the next. If your egg whites aren't at room temperature you can microwave them for a few seconds. Be careful not to cook them! Cold egg whites will curdle the batter. Add batter into prepared cake pans and bake at 335 degrees F for 25-35 minutes or until a toothpick comes out clean when poked in the center. Let cool ten minutes then turn out cakes onto a cooling rack. Wrap warm and place into the freezer to flash chill. This locks in the moisture. Once cool but not frozen you can then trim off the brown edges of your cakes and frost as desired. Chill cake. Combine egg whites and powdered sugar in a mixing bowl with the whisk attachment. Whisk to combine on low then whisk on high, adding in your butter in small chunks, vanilla and salt. Turn mixer up to high and whip until light, fluffy and white. Melt chocolate and water in the microwave and whisk until smooth. Add in a couple drops of food coloring. Let cool to about 90 degrees before attempting to drip over the chilled cake. Once chocolate is set, you can combine the everclear and gold dust to make a paint and paint the drip. I really appreciated the great information in this article. I recently made a white cake for Easter and was so disappointed with the texture. After reading your article, I think I understand what I did wrong. I am for sure saving this in my favorites. Hi there. Can you talk about your gold drip used in these pictures? What product is it? Thanks! Sounds easy cant wait to try it! Oh this is fabulous information. I have been struggling with white/yellow/vanilla for soooo long. I love your vanilla cake recipe, which I change up to make lemon. It is fantastic. I have been searching for a white cake that doesn’t taste like a buttermilk pancake. Weird, but many vanilla cakes taste this way to me. I really want to make a great white cake to pair with my homemade raspberry puree and lemon curd. I also like to alternate chocolate/white cake layers in one tall cake. Thanks so much. Gonna give this a try! I have been searching so long for this type of recipe…. Hi my name is mahirah, i on my way to try this receipes.can i know when should put the oil and milk? Hi, just wondering it says 6 cups of batter makes 2 8″ cake rounds. So does that mean this recipe is only enough for 2 8″ or there is a little more left over? I need 2 9″ cake rounds. I would make a batch and a half for 9″ rounds and you’ll have a little leftover for some 6″ which I always freeze and are great for tastings! Another question related… will this be enough to make a 4 layer 6” cake?? Hi, have been following your recipes for a while and finally have the opportunity to bake so want to try the white cake. When you say wrap, is that in foil or cling film? I want to make this cake this weekend but decorate next weekend, can I just leave in the freezer for a week? Do I then let it defrost or decorate it frozen? I’m going to try this recipe, but I’m wondering what the ounces equate to in cups. Also, do you grease and flour your pans or just grease? Thanks for your help! I made this cake for Memorial Day. It turned out great and got lots of compliments. 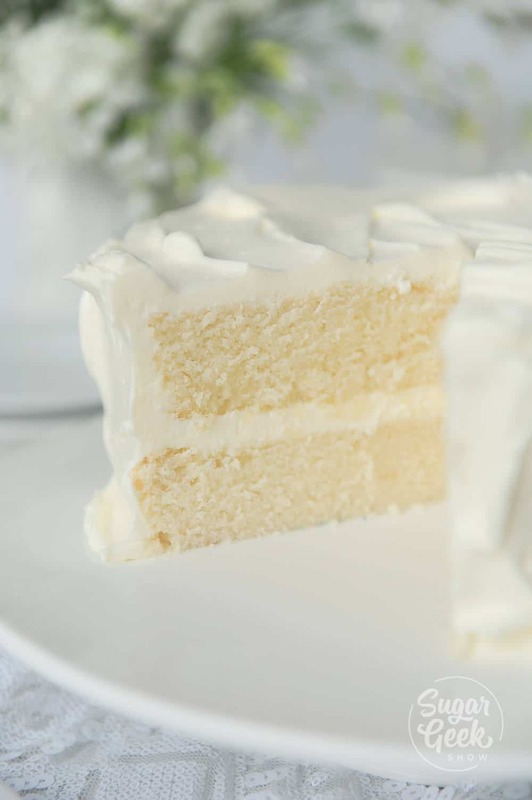 In your opinion, are white cakes and vanilla cakes pretty similar? Changing out clear/brown vanilla and using, or not, almond extract aside…could a “white” cake be a “vanilla” cake? Maybe the addition of whole eggs vs just whites also makes a white cake white. Am I making any sense…. Used this recipe for Memorial Day, and added strawberry jello to make it a poke cake. It turned out wonderfully, and have used this recipe numerous times. 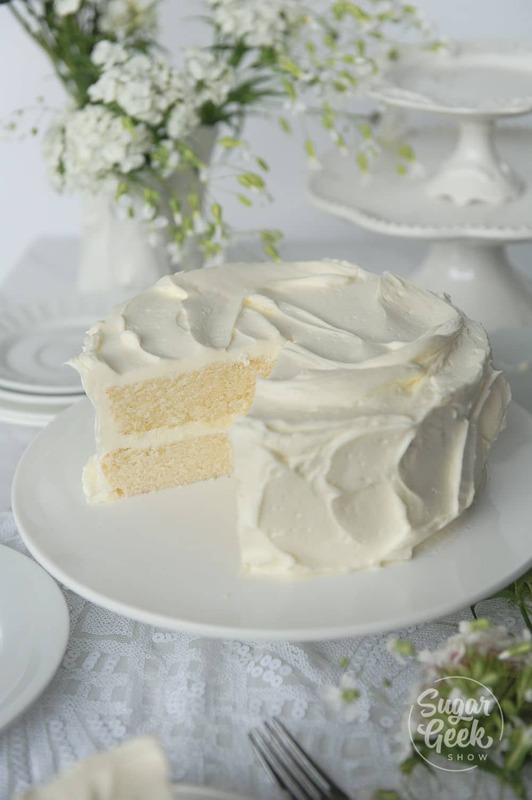 The perfect white cake recipe! How long will this cake retain moisture and flavor— for example, can it be iced one day, fondant covered the next and then decorated the 3rd day and still be moist for delivery the 4th? Will this work for a 9×13 cake? Using a 9×13 pan, is it just enough batter for one cake? Would you need to adjust the temperature or bake time? Bake time varies on the size of the cake, the larger the cake, the more time it will take for it to bake. Nothing else needs to be adjusted. Hi, is this recipe good for making rainbow cupcakes you think? When you say this recipe is enough for 2 x 8″ pans, is that 2″ or 3″ deep pans please? Could I use cake flour instead of AP? Not for this recipe but you might check out the vanilla cake recipe if you want to use cake flour 🙂 It’s my favorite cake recipe! Why do you say cake and pastry flour can’t be used in this recipe? Cake and pastry flour is all I’ve ever use for cakes and they’ve always turned out just fine. I’d be more than leery subbing AP flour for cakes as it’s better suited for yeast recipes & quick breads. Hey there, I say it can’t be used for this recipe because this recipe is formulated for AP flour. 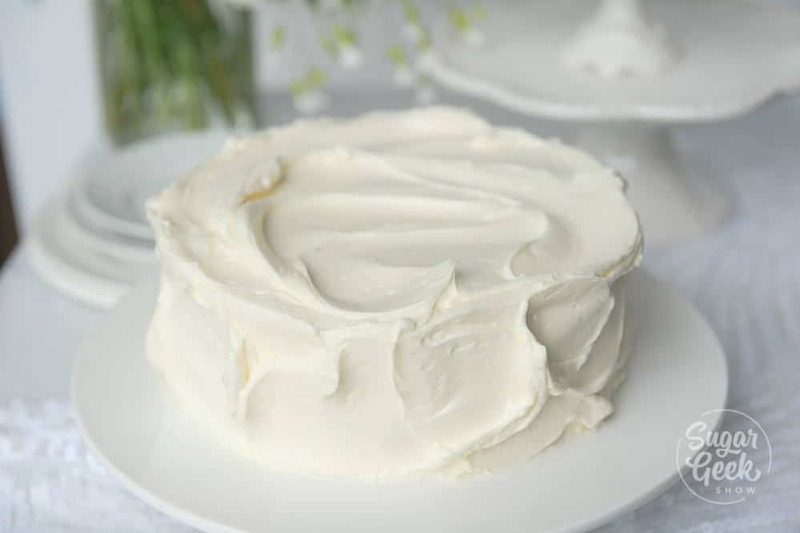 I always recommend that you use a recipe as it’s written and if you want to use cake flour, check out my vanilla cake recipe. Hi if people understood that different flours had different protein levels ( aka gluten) they wouldn’t ask such inane questions. AP flour has 9-12% protein, cake flour 6-8% protein. Should be listed on the packaging nutritional info. 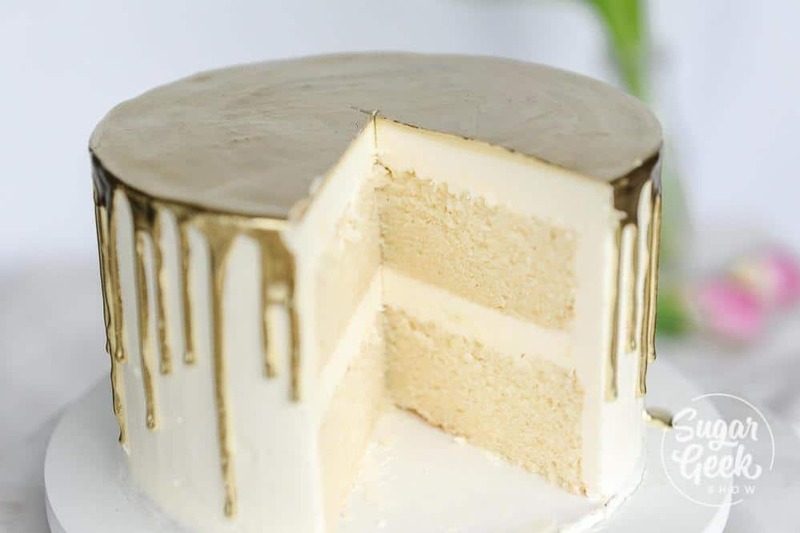 WHat Gold did you paint the cake with? Do u sell it? Is this actually 1 tablespoon of almond extract? 1 tsp vanilla and 1 almond but you can change it up to suit your tastes! When you say 14 oz why not use 1 3/4 cups? Is this American way of measurement? A must have recipe for every Baker. Hi Nicki, did you read the recipe? This recipe isn’t in cups and sticks. I always write my recipes by weight. If you need grams you can easily convert it with an online calculator. Can you stack to a 3 tier and cover in fondant? Is it dense enough? Hi, is the milk and oil liquid measures or by weight? I’m trying this out this weekend, and I want to make sure I’m on the right track. Why do you recommend using AP flour for this recipe, when in you video for baking a cake from scratch, you highly recommend using cake flour? No that will not turn it soggy and that sounds delish! Have you ever iced the cake then froze it for a later date? How did the icing fair? Hello! I am planning to use this recipe to make cupcakes for a rain-themed baby shower. How many cupcakes will this recipe make, and at what point should I add gel food coloring without over-mixing the batter? I assume adding the gel color with the liquids would be best, but I will defer to your advice. Thank you! Hi. I’m a beginner baker, and have only ever made chocolate cakes with any success. White cake scares me, but this actually doesn’t seem too technical and it looks really lovely, so I want to give it a go. I’m baking a large cake for (what feels like hundreds of) 3 year olds and their moms, and I was wondering how you would adapt the cooking time for one large 36cm (around 14inch) cake. Also, if I make a double batch, can I leave the other half sitting out until the first cake is done as I only have one pan. Hi Mandy, the bigger the cake pan, the longer it is going to take to bake. I would start at 35 minutes and see where you are after that. I prefer to make separate batches of batter for each cake because as soon as the baking powder get’s wet it starts bubbling and reacting and if the batter isn’t in the oven then it could affect the rise of your cake. Good luck and have fun! I was a little skeptical when I tried this recipe. I was nervous about the ‘almost’ all butter recipe. But that little bit of oil is genius. It’s a perfect white cake. Amazing crumb, moisture, texture. I couldn’t have asked for a better recipe. Thank you so much! Ok …have to ask …2 pounds of butter in the frosting …that’s 8 sticks! Hi! I am in search of the perfect white cake recipe. Yesterday I tried three different ones (none of them yours!) and wasn’t happy with any of them. My question is, do I try this one or your vanilla cake subbing in the egg whites? What would be the difference? Thanks for your time and your very informative posts! The white cake recipe is made with AP flour and is a pretty sturdy cake. I use it a lot for sculpted cakes. The vanilla cake uses egg yolks so it is not pure white and it uses cake flour so it’s very tender and moist. Just depends what you’re looking for. I think my vanilla is the best! If you can get cake flour I would suggest trying that one and make sure all your ingredients including milk are room temp if not a little on the warm side. Is this your go to recipe if a client requests an almond cake? If so, would you use all almond extract in place of vanilla or 1/2 and 1/2 still? Do you have any recipes for an almond cake with almond flour in it? Hi, could this recipe be used to make mini cake stacks? I would like nice round layers. Sorry but I’m not familiar with that term? Mini cake stacks? Please see link http://www.glorioustreats.com/2012/05/purple-ombre-mini-cakes.html for better understanding. Thank you. What about high altitude? Any ideas or alterations needed? Sorry I haven’t tested this recipe for high altitude because I don’t live in a high altitude area. I am so thankful I was taught weight measurements! So much easier than cups IMO. I’ve never tried a Madeira cake, would love to! This cake unfortunately is not a cake that lasts for a long time. It tastes best if eaten after a couple of days. You should totally try a Madeira. I’d say it’s not far off a pound cake but the crumb is very tight and somehow gets more moist as time goes on. Fab for carving and long lasting. Oh I will try that! Do you have a recipe? Is raw eggs whites in the buttercream not an issue? They are already pasteurized meaning they are heat treated already. I would appreciate if you removed your one-star rating. What can I substitute for pasteurised egg whites ? I am planning to use your recipe for making a wedding cake. My bottom layer is a 12 x 2 inch pan. Does this recipe work well for this size cake pan? Thank you! Hi Liz! Love your work 😍I had a query regarding storing the cake. Once the cake is baked and warm you cling wrap it and store it in the fridge? What would be the shelf life of the cake? How many days in advance can I store my cake, without being dry and retaining the moisture.The reason I’m asking is cos I’m a novice home baker and I struggle with time management. In my homecountry (Belgium) AP-flour is not known. Here we have baking flour to prepare for example bisquit, cake,…and we add potatostarch when we want to change the density and ‘souplesse’of the cake. Can you explain me what’s so different between flour and AP flour(what are the additives)? I love, love white cakes. I plain to bake this soon. It’s looks really tastee!! Hi Liz, If I use this recipe as a base for Oreo cake, do I need to adjust the amount of the flour? I’m going to fold in crushed oreos to the batter. By the way, I tried your Strawberry cake recipe for cupcakes & it was the best, my cupcakes had perfect domes and it was delicious. Thank you so much for sharing your recipes. Thank you, the cake turned out great and tasty! Hi! Do you know what the weight of the egg white would be? I have some saved in the freezer, but can’t remeber how many are in the container. I tried this recipe last evening and oh wow wow wow!!!!!!! I have been using a white cake recipe that I absolutely love but it’s quite a pain to make. 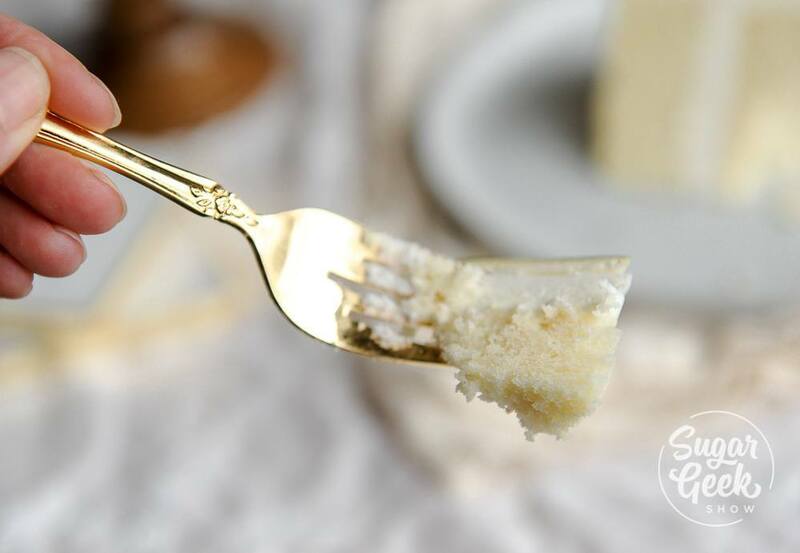 This recipe is now my go to recipe for white cake! It’s soft, melt in your mouth and oh so easy to make. Thank you for sharing this. First off…I LOVE THIS RECIPE! You mentioned freezing in the earlier comments. Do you mean freezing the batter or baked cake? Would butter based batter that are frozen be ruined after freezing? Maybe I should stick with the WASC on this one to ensure it turns out right? A tsp is a tsp, I don’t go by weight. Just follow the tips in the directions for the scratch cake to come out right. It’s really all about the ingredients being room temp or even slightly warm and following the mixing directions. I’m making my first double barrel in a couple of weeks, would this cake be ok to use for this? I will board and dowel the bottom layer like in your tutorial. Thanks in advance! Cake looks amaze! Love your site, so informative and great recipes. But, I also have a question on this white cake why couldn’t you use the pasteurized egg white in the batter also would it effect the texture? I love the buttercream recipe using those been using it for some time now. I have having a lot of egg yolks left over when I don’t make a lot of custards or curds they end up wasted. Thanks again for your time answering all the questions and posting great recipes. Some day I will attempt a carved cake. Don’t have the nerve to do that yet. You can use pasteurized egg whites if you prefer. One egg white is equal to 1oz of liquid egg whites. Swt……Thank you for the Recipe, I really love White cakes .. can’t wait to try this out . Hi Liz! I made this cake a few months back and subbed the almond for additional vanilla but I’m wondering if I can adapt it for lemon cake? I’ve seen your lemon cake recipe but it calls for CF which is very difficult to come by in the UK or it’s expensive and I know you say about using the correct flours for these cakes. If it can be adapted, would you recommend just the flavouring be swapped out or can I add lemon zest? Yes you can adapt this recipe in the same way to make lemon by subbing out extract and adding in lost of lemon zest 🙂 I would use full eggs instead of just whites for a lemon cake. Can you use this for cupcakes? Can’t wait to make this cake. I have been baking for many years but do not know what AP flour is? You must be from another country? AP flour stands for all-purpose flour. It’s just generic flour used in most baking. I love your article. The cake looks wonderful. I have been doing cakes for family and friends about 40 years. I would love to have my frostings between layers was rich and thick like yours. I bought a cake from a local and theirs was like yours. Can you tell me the secret? LOVE, love, love the simplicity of this cake recipe. Beautiful results. Can’t wait to test it out! Question(s): why do you put eggs in your frosting? Is this necessary for some reason? Aren’t eggs supposed to be cooked prior to eating? Thanks for a wonderful white cake recipe and the great explanation that went with it. Thing about a meringue. A meringue is made from egg whites. 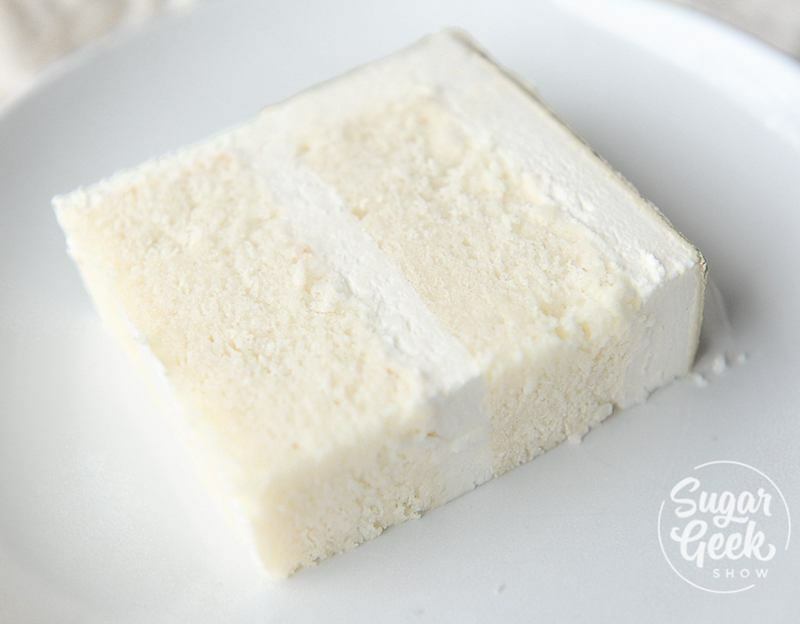 Meringue is what makes marshmallows light and fluffy. Now add butter to that meringue and you have frosting that’s super light and fluffy and not as sweet as regular frosting. Trust me, it’s a real thing. This is a simplified version of a traditional recipe called Swiss Meringue Buttercream. The whites have been pasteurized (heat treated) already. Butter… ounces by weight or ounces by volume? hHiiiiiii……oz are USA or British??? I’m not sure what you mean, oz is a form of measurement for weighing ingredients. My cake is in the oven right now and I’m curious to see how it is going to turn out. I used a measuring cup to measure 14 Oz, of sugar and flour, not a scale. I may have a mess in my hands. Yea unfortunately you can’t substitute cups for a scale 🙁 I do state that in the recipe. Hi, I’m just trying this recipe out tonight and had a few questions. I’m very excited to give this a shot! First, what exactly does curdled mix look like? I thought my eggs were room temp but I think they might have been cold (it’s December in Canada lol). I’m not sure what the better should look like when you’re done adding the eggs, but I feel like by the end it looked a little off. If a batter did curdle, would it effect the end result very much? Second, if one wasn’t worried about having a white cake could you use maybe 4 full eggs instead of 6 egg whites? Can u help me pleaseeeee??? my scale is in grams how can I turn this recipe to grams? I am baking this cake for my sister’s wedding. We have to leave for the wedding on the 25th and her wedding is in the 27th. I was going to bake on the 24th and wrap for in the refrigerator. I was also thinking maybe I should make this weekend and freeze until we leave. Do you have a recommendation? I am making 8″ 10″ and 12″ layers. Two of each size. Do you have to travel with the cake? Driving I assume. You can definitely bake the cakes ahead and then decorate when you arrive to where you are going. That would be a lot easier than trying to travel with a fully decorated cake. I would not freeze because they will just defrost during travel. This was such an excellent white cake recipe, I only used 1.5lbs of powdered sugar for the frosting rather than 2lbs and it was sweet enough!! Made this for my grandmother for her 72nd birthday and it was a hit! I discovered many years ago purely by accident, aren’t all good discoveries made that way, that you can make packaged/boxed cake mixes taste just like scratch made ones with a simple trick. I was having my sons birthday party and as time was pressing I used a couple of cake mixes but although I had mixed one of them didn’t have the time to put it in the oven before going to get him from school so just covered it with a tea towel/dish cloth and when I got back to it I thought well here goes and baked it as usual… you would have thought one of those celebrity chefs had baked it by the reaction I got from people… best cake ever, can I have the recipe and all that stuff. Seems if you let it stand it has time for that terrible cardboard taste to go and the true taste to develop and you can fool people and smile, I do it whenever I need to make cakes these days so I hope this helps anybody who needs to make cakes this way. Interesting! I have known people to let their mixes rest before baking, I’ll have to try that one out! How long did you let your mix rest before you baked it? 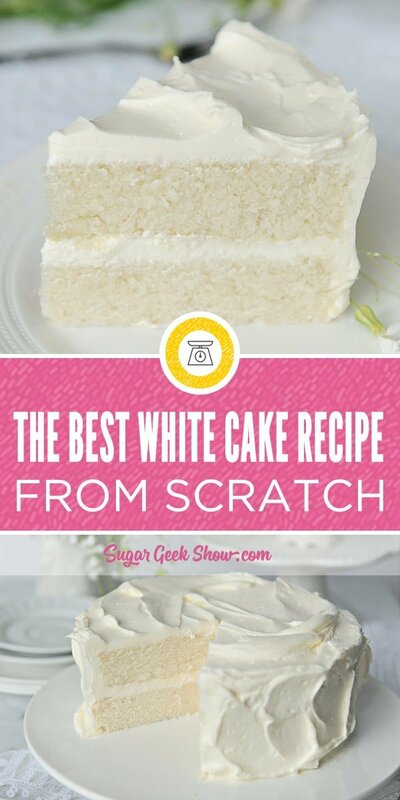 I’ve tried countless white cake recipes!!! (Not yours) and it seems like everyone is this and grainy kinda like cornbread?!??? I have no idea what I am doing wrong. I won’t to try yours, but can you give me any advice on how to avoid whatever I’m doing first?!? It could be that you’re not brining your ingredients to room temperature (especially eggs and milk). I actually put my eggs in warm water before cracking them so they are slightly warm and I microwave the milk so it feels slightly warm. This will help your ingredients combine together properly and make that super fluffy cake texture. Until I realized all the unhealthy chemicals in a box cake, I baked, and loved traditional boxed white cakes like Pillbury/Duncan Hines. So would you suggest your Vanilla cake or this classic white for a comparable taste? Also, if I omit the almond extract, would I then use 2 tsp of pure vanilla instead of one? Eager to make this cake, the reviews are great! I don’t have almond extract on hand so could I substitute fresh lemon juice instead? Lemon juice and almond extract are completely different flavors? If you don’t have almond extract just leave it out. Do you think using carton liquid egg whites for the cake instead of fresh eggs will terriably alter the texture and taste of the cake.. I’d like to make 3 8 inch rounds and never know what to do with the yolks! Love your tips, recipes and personal stories and reflections of how you develop your cakes and techniques! Im a doctored box mix convert, Ive got a ton of flavors im now trying to convert to scratch. Currently im working on my pineapple cake. How would you incorporate pineapple juice in to the cake without affecting the texture and moisture content? In the article you say that white cake does not have egg yolks. But in the recipe I see that you have eggs (complete). I do not understan! I am still on the hunt for a vanilla cake and a white cake. I am making a champagne flavored cake but with emulsions because its for a baby shower. Do you reccomend the vanilla cake or the white cake for this? I am making this recipe as we speak. Is the batter supposed to be really thick? I have never made a cake from scratch before. Box mix batter is thinner… you can almost pour it into the pans. This is almost as thick as frosting. ????? Could I use buttermilk in this recipe? So I have been baking cakes for a very long time and my daughter wanted me to make this recipe with her. Upon mixing the batter, I could already tell something was off from what I’m used to, but I know every recipe will be different, especially with different ovens, weather, ingredient qualities, etc. However, I also noticed the taste of the batter was off as well in a rather unpleasant way, after having followed all directions; it reminded me of other recipes that called for too much of X and I couldn’t quite place what ingredient I was tasting too much of. But I put them into two round cake tins and baked them anyway. I have to say, I am very confused, I haven’t seen many cakes do this. They took nearly 1 whole hour to bake. The texture was very greasy, and saturated in a way that was borderline rubbery and the top formed a solid, caramelised crust. In addition, the taste was remarkably displeasing and bland. I don’t want to say this recipe is awful yet but I’m struggling to find a reason as to why this happened after doing everything exactly, and double checking to make sure everything was at the correct amount, and it was. Help? If the recipe seemed off from the very beginning then I am guessing you made a mistake with your ingredients, the eggs and milk where not slightly warm so they didn’t mix up properly or you didn’t mix them correctly. Since you are the one that made the recipe, you’re the only one that can figure out where it went wrong. We used to do this in pastry school when our baking didn’t turn out right. Our chef would have us go through the recipe line by line to see where we might have gone wrong. I can assure you the recipe is balanced and turns out great for myself and many others who have tried it. Hello! I am excited to try this recipe! We don’t have a good scale. 14oz is same as 1.75 cups. Is this ABOUT what you used? We only have cups. Thanks. Hello, I highly recommend getting a scale to avoid wasting ingredients. Proper measurement of ingredients is very important to your cake turning out. Measuring by cups is not accurate which is why weight is used instead of cups. If you try to guess the cake is not going to turn out. You can get a simple scale at any grocery store. Hi Liz! First, let me just say I love all your stuff!!! I bake alot of cakes, and always have trouble using up egg yolks, even with alot of lemon curd, etc. I am not concerned with having a pure white cake, so can I use whole eggs with this recipe? If so, how many? Will it change the texture of the cake? Does it affect scupting/carving? What are your thoughts on boxed egg whites in this recipe?? Thanks, and again, I love your ideas, recipes, and cakes!! Yes you can use whole eggs if you prefer, one egg white weighs 1oz and a whole egg weighs 1.67 oz (roughly) so two whole eggs equals about three egg whites. I hope that makes sense. Your classic white cake instructs to wrap warm cake to chill. What do you use to wrap the cake? Could I use buttermilk instead of regular milk in your recipe? Pros? Cons? Thanks!